Add simplicity and convenience to your fireplace with remote controls and wall switches. Our advanced remote technology allows you to turn your fireplaces on and off, activate fans, and set timers and thermostats with the click of a button. And for a classic finish, our termination caps provide the perfect finishing touch to your fireplace systems. 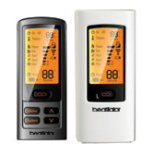 Enhance the functionality of your fireplace with remote controlled accessories from Heatilator. Enjoying your hearth becomes simple with the flip of a switch or tap of a button. Take convenience to a new level with fireplace remote controls. Simply point and click to start enjoying the comfort of a fire in your home. Take a look at our catalog to find a remote product that will work best for you. Offering both decorative and traditional gas termination caps, Heatilator can help you polish your fireplace system with the perfect finishing touch. 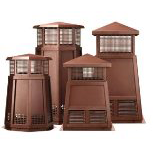 Wood termination caps from Heatilator finish off your new fireplace by enhancing its overall look as well improving its performance. You are left with a home heating system that looks great and performs above the rest.